As you know from reading my blog, 6yo loves doing art and crafts. I have seen other bloggers writing about being Baker Ross bloggers, and I always thought that would be one of my blogging achievements. You can imagine how happy I was when the email dropped into my inbox a few weeks ago inviting us to become Baker Ross Bloggers. Of course the answer was a big YES. 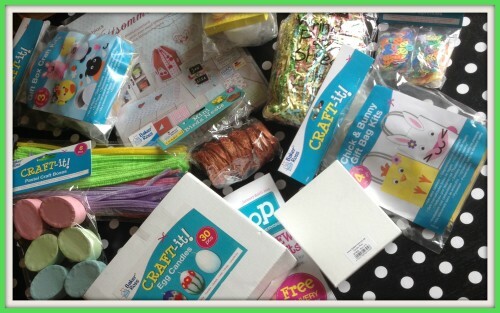 Our first box arrived last week, as with Easter in the near future, we had lots of Easter crafts to try. 6yo was in her element unpacking the box to see what was included. There are so many ideas to use inspiration and create our own crafts and pictures, but 6yo decided to use some of the kits to create some gifts for her friends at school. She has since used some of the paper designs supplied in the large A3 pad to create Easter cards, and decorated some of the little trinket boxes which she has filled with some of the Easter themed confetti. Such simple instructions that she has been able to pick out a kit and doesn’t need any parental help to complete them, which I think is a great idea for confidence as well as imagination. The candle decorating pens caught my eye, and I was keen to investigate those. I didn’t realise such pens were available to purchase to be able to decorate candles. Basically it’s liquid wax in a pen that dries in around eight hours. The first candle 6yo tried turned out a little messier than she would like, but once she had gotten to grips with the pens and how to hold and squeeze them, she was rocking with her designs. From nests to shredded paper, to pipe cleaners, sponges for painting, this Easter holidays we wont be bored thanks to Baker Ross. I love the look of the candle pens, I think I’d be trying them out if I were you! Looks like she has been having great fun! The candle pens sound like a great idea! I love the materials and craft kit supply by baker Ross. They are great quality and also fab ideas too!